Situated in the heart of Old Town Alexandria, Gadsby’s Tavern Museum is a fascinating site brimming with history from the 18th and 19th centuries. Everyone who was anyone in the ever-evolving political and commercial landscape of the time would have spent hour upon hour there – eating, drinking and engaging in heavy debates over the issues of the day. It was not, however, the first tavern on the property. It became the fourth, when Maryland native John Wise purchased the plot in 1782 from Edward Owens, and built the current Georgian-style structure. In 1796, Englishman John Gadsby leased the City Tavern from Wise. He renewed the lease in 1802 to include the smaller 1780s tavern and operated both until 1808 when he moved to Maryland. But the Gadsby name remained. The property actually consists of two connected taverns – the first built in 1785 and the second in 1792 – meant to accommodate the ever-growing hospitality industry and Alexandria’s bourgeoning trade economy due to the end of the Revolutionary War and the city’s port location on the Potomac River. My husband and I arrived there on a Saturday morning in the summer when the museum was featuring the Specialty Tour: Hamilton BFFs and Frenemies – a takeoff on the intense popularity of the Broadway musical, Hamilton. We made the right decision to join up with the eight others assembled and learn about the history of the tavern, Alexander Hamilton, and many of the other prominent politicians of the era. College student, Julia Nashwinter, was our guide for the hour-long tour. While we were the first tour she had ever conducted, it was obvious she had done her homework. Her enthusiasm and knowledge of the tavern and events of the time provided more intimate, historical detail than you’d ever find in a school book. First, we enter the public dining room, replete with period furniture and tables set with serving pieces and food that was indicative of the time and its location in the South, close to the Chesapeake Bay. The oysters on the half shell look quite succulent and you can almost smell the Virginia ham. In your mind, you can hear the glasses clanking as one toast after another is made. But not everyone was invited to participate in these wonderful offerings. To better understand the type of guest who would be welcomed to eat or drink in the tavern or stay overnight in one of the few bedchambers, Julia had us all pick a slip of paper with a listed persona. We had to decide whether our character would be in the mix. This interactive exercise brought about interesting conversation and laughter from all of the tour guests. We found that wealthy merchants, plantation owners, and craftsmen were among those who regularly visited and were welcome. Upper-class white women generally entertained at home but lower-class white women would have been there only to perform domestic work. Enslaved or free blacks would have been there to perform services, such as cooking and cleaning up, or other chores mainly in the outer buildings in the rear courtyard. So many of our founding fathers spent time or stayed at Gadsby’s Tavern. Some had to travel hundreds of miles from their homes in order to participate in the critical political gatherings and debates around the Articles of Confederation, which would change us from a collection of self-ruling states into a cohesive nation. Other local standard-bearers of the time such as Washington, Jefferson, Madison, Lafayette and Hamilton’s nemesis, Aaron Burr, all frequented the tavern, where the drinking was plentiful and the discussions frequently heated. These and other political elite were the only ones with a voice in the political process. Entering the private dining room, we learn about some of the groups who met there while trying to maintain a high degree of privacy. One such group was the Potomac Company, backed by George Washington and authorized in 1785 by Maryland and Virginia, to make improvements to the upper areas of the river. High on the priority list was digging a canal to bypass the Great Falls area and widen the Potomac in certain spots to make it more navigable in reaching the more western lying farmlands. In November of 1785, the Board of Directors of the Potomac Company advertised that “100 Negroes are wanted on hire…,” which was a popular means of obtaining helpers and for owners to rent out their slaves. Slavery was a hot topic at the time – even Hamilton, who fancied himself an abolitionist, was a slave owner who feared bringing up his real feelings on slavery. Yet, in Gadsby’s Tavern and Alexandria as a whole, slaves and white laborers frequently worked side by side. As we moved on, our attention is brought to a fire insurance diagram outlining the two main tavern buildings and the six courtyard structures used as a kitchen, wash house, necessary, stable and coach house, where enslaved people cooked, tended to the horses and hand-washed the laundry. Today, the area is utilized for special events. There are also the assembly room and large ballroom, which were used for entertainment of the period. 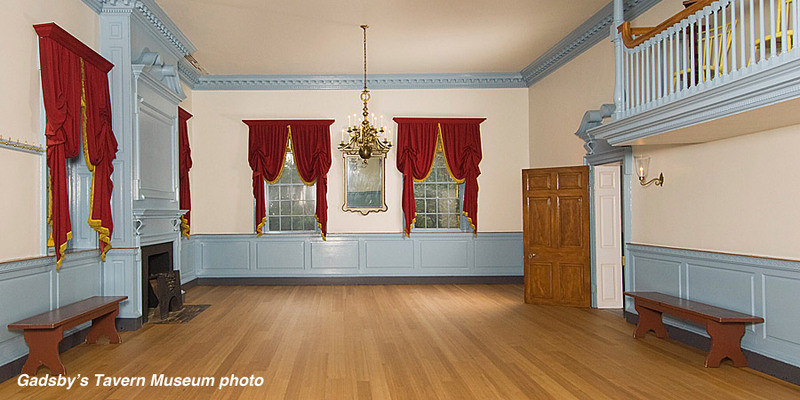 One can easily imagine the festive cotillions and exclusive social events that were held in this exquisite ballroom, boasting detailed woodwork and colonial blue color. Washington attended several birthnight balls celebrating his birthday in that room and Thomas Jefferson hosted a banquet honoring his inauguration in 1801. With the nation’s capital now on the Potomac, Alexandria and Gadsby’s Tavern began playing integral roles in so many of the social and political events of the time. Our tour, while only an hour, yielded a wealth of information about the history of the property and the many well-known figures who frequented it. The museum provides a very wonderful, personal connection to the people and events of the past. Directions and museum hours are available here. 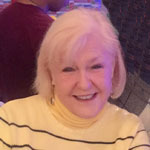 Debbie Brown Driscoll is a freelance writer and retired PR consultant. She grew up in Northeastern Pennsylvania, but has called Annapolis, Maryland home for nearly 20 years. Her passion is visiting and writing about the history and happenings in the Chesapeake Bay area.